Explore, Protect, Preserve, Publish - our team of scientists and underwater cave explorers is dedicated to protection of Florida's karst and groundwater resources. Foundation members, while extremely skilled technical divers, are also first rate professionals holding advanced degrees in many areas of environmental protection and engineering. They are all driven by the same goal of protecting Florida's unique natural resources. Our Team was tasked by the Southwest Florida Water Management District, under the Community Education Grant program, to place educational signs around sinkholes in Hillsborough, Pasco, and Hernando counties. What happened to the old swimming hole? - In 1920s Sulphur Springs was a booming Mediterranean style resort. 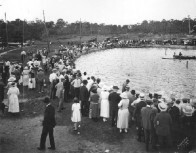 The neighborhood had it's own hotel, movie theater, restaurant, hardware store, bank and street cars brought visitors from Tampa to visit the spring fed swimming hole and scenic area surrounding Hillsborough River. Today only the renovated movie theater, the white ornate gazebo and some dusty old postcards remind us of the old days. More.. Some of us participated in creation of live 'webcast' for FloridaSprings.org and in filming the Water's Journey at Wakulla Springs in North Florida. Filmmaker Wes Skiles directed team of cave explorers and Mexican underwater archaeologists. This expedition brought many new discoveries about ancient Mayan burial traditions and their tight connection with underground water and Cenotes. Read more about it in October 2003 issue of National Geographic. Yaxcaba Expedition - survey of unexplored cenotes in Yucatan. Curt Bowen, publisher of Advanced Diver Magazine, and five sidemount divers catalogued number of new unexplored cenotes in central Yucatan.